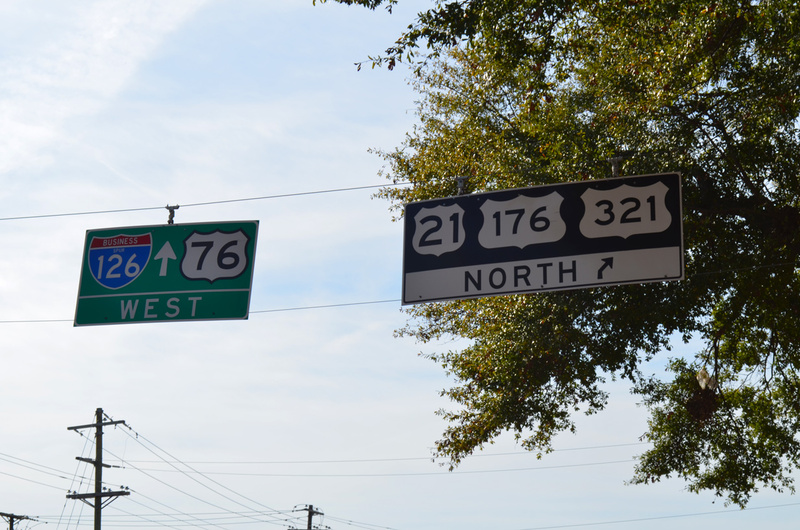 There are no business rotues for Interstate 26, but two of its branch routes have spurs. SCDOT utilizes Spur and Connector routes as part of its U.S. and State Highway inventory, though these are seldom signed. Five Interstate Business Spurs are included in this system, though only two are signed (the east ends of I-20 and I-526). All five otherwise consist of arterial or surface street extensions from freeway ends. These include the north end of I-385, the south end of I-585 and the east end of I-126. 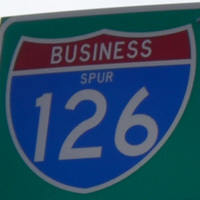 Business Spur I-126 overlays a half mile section of Elmwood Avenue from the freeway end of I-126 at Huger Street (U.S. 21-176-321) east to Main Street. Outside of one sign on Elmwood Avenue west at Main Street, the route is unposted, as U.S. 21-76-176-321 also travel the six-lane arterial. Located in the Charleston suburb of Mt. 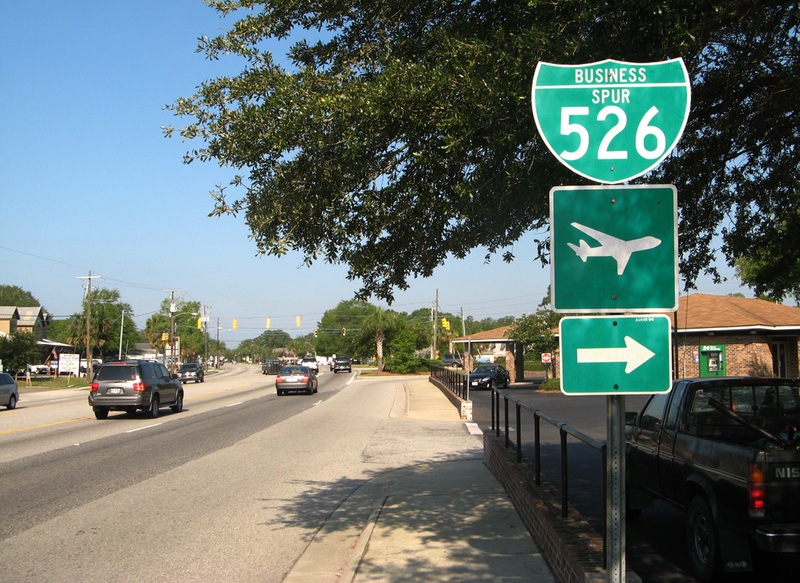 Pleasant, Business Spur I-526 is Chuck Dawley Boulevard, a 1.3 mile route connecting the east end of Interstate 526 with South Carolina 703 (Coleman Boulevard). The five-lane boulevard serves a residential area south from U.S. 17 to S.C. 703 as part of a route to the beaches of Sullivan’s Island. S.C. 703 east from the Arthur Ravenel, Jr. Bridge to Chuck Dawley Boulevard, and Business Spur I-526 east back to U.S. 17, follow the pre-1960s routing of both U.S. 17 & 701 through Mount Pleasant. The two routes were later signed as U.S. 17 Business and named Old Georgetown Highway when a new alignment for U.S. 17 opened to the north. Further changes took place when South Carolina submitted an application to AASHTO for the elimination of the bannered route, truncation of U.S. 701 north from Charleston to Georgetown, and the establishment of Business Spur I-526. These requests were all approved by AASHTO on June 15, 1992. 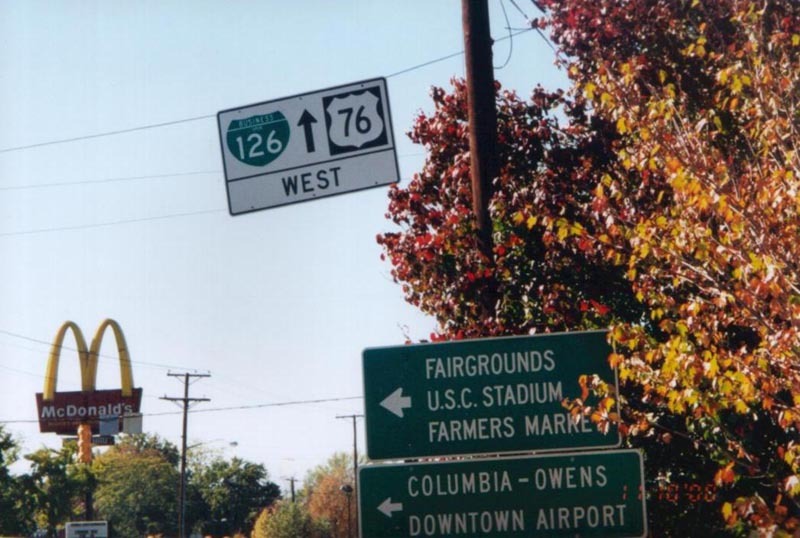 Email correspondence with Paul Martin, November 4, 2000.
Business Spur I-126 & U.S. 76 (Elmwood Avenue) west approach their merge with U.S. 21-176-321 (Main Street). 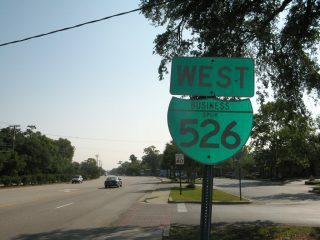 The five routes combine westward five blocks to a directional T interchange with Interstate 126 west and Huger Street south. Photo taken by Paul Martin (2000). This span wire based sign was eventually replaced, but as of June 2016, still displays a Business Spur I-126 shield, albeit on a tri-color shield. 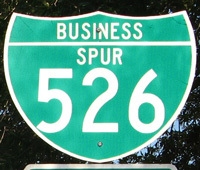 Business Spur I-526 begins and travels west from South Carolina 703 in the town of Mount Pleasant. Photo taken 05/30/07.